Dave’s Pet Food isn’t like many of the big brand pet food companies on the market today. The main difference doesn’t stem from the pet food quality but from the fact that Dave does most of the marketing and selling himself. Today, Dave’s Pet Food is sold in well over 2,000 stores across the U.S, and more and more people are turning to this little, yet highly reliable brand for their pet food needs. Maybe it’s because Dave’s Pet Food doesn’t have to deal with a lot of overhead costs or maybe it’s just good business but the products from Dave’s Pet Food are not only made with the highest possible quality standard, but they have remained highly affordable despite their popularity. It’s this combination of having an excellent product in the market that has a reasonable price tag that has made Dave’s Pet Food a household brand name for many pet lovers across the U.S. Started well over 20 years ago by owner Dave Ratner, Dave’s Pet Food is part of Dave’s Soda and Pet City stores. Dave started this because he wanted to provide the market with high-quality pet food that was also affordable. As a dog owner himself, Dave understood the fact that pet owners wanted to provide their furry friends with the best and most nutritious food but that they might not always be able to do so because that can be a little hard on the wallet. So, he created a brand that could merge the two worlds. Dave isn’t shy about the fact that he isn’t a nutritionist but a salesperson. He acknowledges that he sought the help of a renowned animal nutritionist when he was creating Dave’s Pet Food. Slowly they created the first line of Dave’s Pet Food, and as that become popular and the brand grew, they gradually introduced other products into the line including grain-free pet food and wet food options. Over the last two decades, Dave’s Pet Food has adhered to a strict level of professionalism and high standards of pet food production. In fact, the company has only ever had to recall their products once in its entire lifetime. That was in June of 2018 when the company itself initiated a recall of their 95% Premium Beef cans for fear that the product might potentially have unsafe levels of beef thyroid hormone. Why Buy from Dave’s Pet Food? If you consider the price and the sheer range or variety you get from Dave’s Pet Food, you will find that doing business with this brand is worthwhile for pet lovers who want to offer their furry friends the very best at an affordable price. The thing about Dave’s Pet Food is that it has a wide variety of wet dog food but a limited selection of dry dog food. With that in mind, here is a review of a few options within their selection. This review looks at some of the popular products produced by the company and touches on the different kinds of pets that could benefit from them. Dave’s Pet Food Chicken Meal & Brown Rice Delicate Dinner is designed for dogs that have sensitive stomachs. It has easy to digest ingredients that are very high in fiber which helps your pooch maintain a healthy digestive system. It doesn’t have any wheat or even wheat gluten, and as is the norm with all of Dave’s Pet Food products, it doesn’t have any artificial colors or flavors. Additionally, there is no beef, soy, corn or any dairy products in this particular meal. It does, however, have oligofructose which feeds the good bacteria in furry friend’s intestines thus improving his/her chances of better digesting their food. 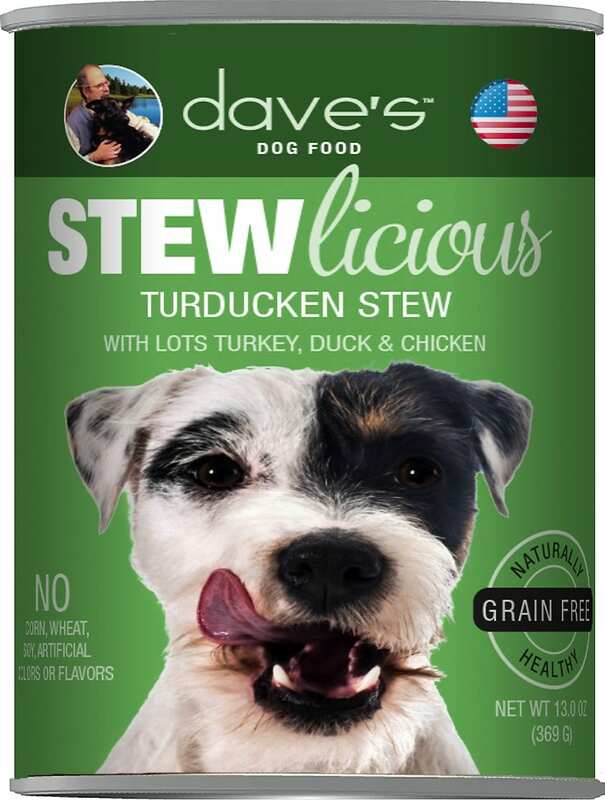 This Stewlicious Meaty Beefy Stew Canned Dog Food is in strict keeping with Dave’s Pet Food tradition and standards in that it’s nothing but the best beef sty in a can at the best and most affordable price. The recipe used in making this delicious beef stew contains real beef, carrots, beef liver, wild rice, green beans, red peppers as well as some fruit to give your dog a delicious, mouthwatering meal that is well balanced from a nutritional standpoint. The best thing about this meal is that it comes with a rich beef broth that is naturally flavored with chunks of beef as well as vegetables. It doesn’t have any corn, soy, wheat or gluten which makes it very easy on your dog’s tummy. Dave’s Pet Food has continued its illustrious history of providing the market with nothing but the best food for your pet at an incredibly reasonable price. The fact that there has ever only been one self-initiated recall in its history shows that Dave’s Pet Food cares more about your pet’s health than it does its brand image or bottom-line. That is a company you can trust with the wellbeing of your furry friend.